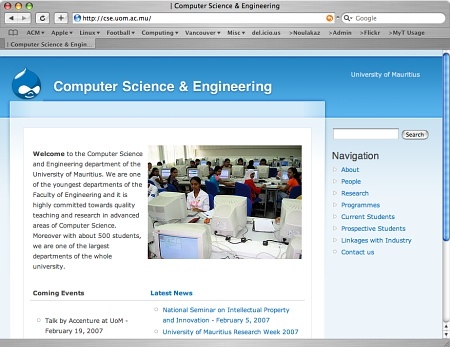 I’m happy to announce the official launch of Computer Science & Engineering departmental website of the University of Mauritius. This website has been built over a period of two months by members of the CSE Website Subcommittee which I chair. The other members are Pascal GROSSET, Begum DURGAHEE, Dr Shakuntala BAICHOO, Sheeba ARMOOGUM and Soulakshmee GHURBHURRUN. The initial content is relatively complete and it’s bound to become better as time passes. Don’t hesitate to contact me if you have any suggestion. Incidentally, I have done most of the photos on the website using my new Canon A540 digital camera with some processing courtesy of my Apple MacBook. The website is powered by the Drupal content management system, uses some custom PHP scripts, manages its data in a PostgreSQL database and runs on the Apache web server and Kubuntu Linux operating system. seems like the dept is moving.. This is a fantastic mini-site that includes all necessary information for prospective and current students. It has an easy-to-use and elegant interface, respecting many HCI guidelines. It’ s just superb. More: It’s dynamic and powered by Linux – how great! The obvious next step will be to have lecture notes and a study guide for each module online. But this is the responsibility of the lecturer teaching the module. Personally, I’ll update my pages as regularly as possible. Well, honestly, having played a lot with php myself i’m not really impressed. Filling in the menus and adding content in a ready made CMS is within the reach of everyone. I mean the current theme looks like one of the default ones that come with drupal. The lecturer profiles’ pages seem to have mixed up with Mrs Agarwal’s name cascaded on so many pages (except yours and Pascal’s). Sure it will get fixed in a breeze. To give you my candid opinion, I find the site well designed with a nice touch of simplicity. In fact, it’s like when you first setup your wordpress blog. You just the default Kubrick theme. We did the same thing here. The default Drupal theme was good enough (especially compared to what is used on the UoM website). The really hard part was to build a team of volunteers and to design an optimal navigation structure. And I believe the contents is good enough for a first iteration. I visited the site last night following your email to the Linux group. Very nice, simple and most important of all, no Adobe flash stuff :-) that just take much bandwidth. The website is being hosted on a plain PC in our “server room” (this is supposed to be sarcastic) running Kubuntu Linux. We have really tried to create something focussed on giving adequate information to all our potential audiences. it seems that the new heads in the cse dept are actually getting something done, congrats to the website sub-comitee..
though being simple, i find the site quite interesting… getting to actual content in 2-3 link clicks is great! knowledge should be shared… and frankly i dont feel it would do harm to place a copy of lecture notes found on dolphin on the web site… no need for complex cms, i guess most students will be satisfied getting directory listing access. In the long run, we’ll get rid of Dolphin! green peace won’t be too happy about that. This is kinda off topic..
site very informative but not conforms to web standards. I’ve checked my markup. It seems to be ok (i.e. the error found are not from what we wrote). The problem might be with Drupal (which we use as a CMS). I’ll investigate. I want to learn how to create an operating system to rival microsoft and im serious. If you mean an OS to rival Windows, then you are lucky as there are already many of them around. Try Ubuntu (which is a Linux distribution) or FreeBSD. If you don’t mind buying an Apple computer, Mac OS X is an excellent choice. … and, of course, five years later, the website does not exist anymore. Regression. I’ve always wondered why didn’t CSE students task themselves on say a final year project or even better as an open source project to rewrite the UOM website using Drupal. I would have gladly contributed to it. As an example i was extremely surprised recently when talking to a couple of CSE lecturers that they had no idea what git (and github) was. Try to talk to the Director of CITS. He is the one who manages the team responsible for the website. Drupal is good but, personally, I’ve transitioned 100% towards WordPress: it’s simpler and themes and plugins are plentiful. Thks for your suggestion i will try that. Anyway i think its up to us to educate the younger generation about the amazing technology out there and foster their curiosity to innovate…. You’re 100% right : the future of Mauritius depends a lot on its (young) entrepreneurs.